Your workstation should be set up to cause the least amount of stress on your body. Prolonged hours of poor posture or repetitive work habits, often in a stressful environment, can result in significant overuse injury. Applying the following points can help minimise such injuries. Sit in front of your workstation such that your monitor is directly in front of your face. 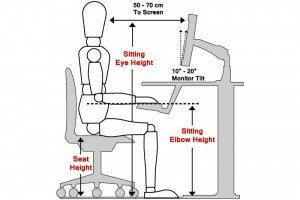 Do not sit too close to your monitor – you should be at least an arm’s length away. Take regular breaks every hour, stretch your legs, and perform simple mobility exercises to limber. Avoid rubbing, probing, or “poking” in the areas your physio treats. Avoid sudden twists or turns of movement beyond normal limits of motion, especially of the neck. Avoid extreme bending of your spine in any direction. Avoid stretching, reaching, or other overhead work. Be particularly careful when brushing or shampooing your hair. Avoid bending or stooping sharply to pick up objects. Rather, bend your knees to minimise the strain on your lower back. When lifting, keep your back straight, bend your knees and let your legs bear the strain. Hold the object lifted as close to your body as possible. Participate in simple exercises to strengthen your body, but avoid jarring activities, which place stress on your neck and spine. Watch your posture at all times, stand tall, sit tall, sleep tall and THINK tall. When sitting, choose a chair that has adequate firmness to hold your weight comfortably, and then sit straight. Avoid too soft, overstuffed chairs. Recliner chairs are acceptable if they are constructed so that when you are reclining your back is in a normal straight position. Sleep on a firm mattress, preferably one which is neither too hard nor too soft, but just firm enough to hold your body level while, at the same time, soft enough so that your shoulders, buttocks, et cetera, will depress into the mattress. Your pillow should be neither too high nor too low. The ideal pillow is one which supports your head so that your neck vertebrae will be at level with the rest of your spine. Avoid sleeping on two pillows, never lie on a couch with your head on the arm rest. Do not read or watch TV in bed with your head propped at a sharp or strained angle. If you have any questions about any phase of your health care, feel free to ask your physiotherapist. Correct sitting posture is an essential ingredient to preventing spinal injury and fatigue. Move the lumbar support so that it fits snugly into the curve of your lower back. This will help prevent lumbar strain and help maintain a straight spine and neck while seated. Never sit with your legs crossed. Crossing at the ankles is a preferable alternative.